Preheat oven to 300 degrees F (150 degrees C) and place oven rack in the Center of the oven. Line 12 muffin cups with paper or foil liners. In a small bowl combine the graham cracker crumbs, sugar, and melted butter. Press a heaping tbsp of crumbs onto the bottoms of the 12 muffin cups. Cover and refrigerate while you making the filling. In the bowl of your electric mixer (or with a hand mixer), beat the cream cheese on low speed until creamy and smooth. Add the sugar and salt and beat until combined. Scrape down the sides of the bowl as needed. Add the eggs, one at a time, beating until incorporated. Add the vanilla extract, lemon zest, and sour cream and beat until incorporated. Remove the crusts from the refrigerator and evenly divide the filling among the 12 muffin cups. Bake for about 18-22 minutes or until firm but the Centers of the cheesecakes still wobble a little. Remove from oven and place on a wire rack. Let cool and then cover with plastic wrap and refrigerate for several hours or overnight. In a stainless steel bowl placed over a saucepan of simmering water, whisk together the eggs, sugar and lemon juice until blended. Cook stirring constantly (to prevent it from curdling), until the mixture becomes thick (like sour cream or hollandaise sauce) (160 degrees F or 71 degrees C). This will take approximately 10 minutes. Remove from heat and immediately pour through a fine strainer to remove any lumps. Cut the butter into small pieces and whisk into the mixture until the butter has melted. Add the lemon zest and cover immediately to prevent a skin from forming. Let cool until it of pouring consistency. 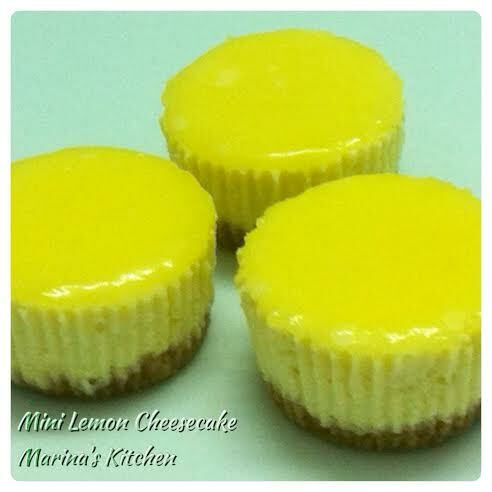 Once the cheesecakes have been chilled, pour a heaping tbsp of the lemon curd on top of each cheesecake. Gently smooth the lemon curd to form an even layer. Cover and return to the refrigerator for several hours or even overnight. To serve, gently remove the paper liners. If desired, use a small metal spatula, that has been dipped in hot water and wiped dry, to smooth the sides of the cheesecakes. The cheesecakes can be stored for several days in the refrigerator.